This Arduino MIDI sequencer has no shortage of ways to display loop info. The screen above is a touch-sensitive interface that acts as the user input. But if this screen is not visible, you can still see which tracks have activated samples for each beat and what effects are being used. That’s thanks to the collection of display boards which are shown in the video after the break. The setup acts as the MIDI front end, relying on other hardware to generate the samples. It presents all of the options through several pages on the 320×240 touch screen display. The Ardunio Mega is responsible for monitoring the UI data, crafting and sending the MIDI commands, as well as updating the LED-based display boards. These include bar graphs for the various effects, a four row by sixteen pixel beat pattern display, and 7-segment displays to track the current location within the loop. All in that’s 368 LEDs driven by 18 shift registers. Update: Link to a gallery can be found after the break as well. Pretty cool, I like the display but I’m not sure why there is so many external leds , wouldn’t there be a way to do that on the screen too. The redrawing looked a bit slow so maybe that’s why. 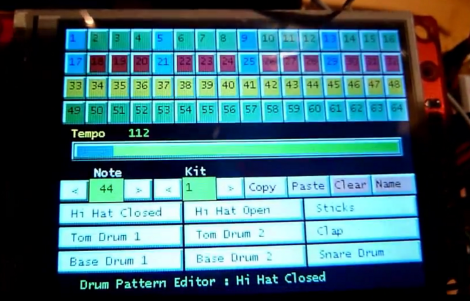 The fact that they built a full MIDI DAW on an Arduino blows my frickin’ mind. And the interface looks fantastic. Ladies and Gentlemen, this is how you Arduino like a boss. Hi , Why there so many External LED ?? Next week i build a cover for it. After this i Upload a New Video. And here a Additional Video about the Metherbridge for the Drum Parts I build Last night .. I really like those. In the early days 10 years ago i cut sythesizer 505 virus indigo evolution mixer in peaces and build from this one instrument. Now i think when i see the arduino prx i waste my time. I have one question does this sequencer has a interface to record and playing midi sysex dumps via midi in and out from other synthesizer?